It’s a statement of fact that if you own a home, you want to maximize opportunities to maximize and utilize that space for multiple reasons. Whether it’s to improve the resale value of your home, to have an exceptional entertainment area or simply add more rooms for guests, there are multiple benefits of improving the overall look and feel of your property. One of the quickest growing home improvement tips that not only maximizes space, but can significantly improve the equity and resale value of a home is the process of having upgrades the basement made by professional contractors. Although most basements were initially designed as storage or even protective areas in locations where tornados were present, their use has significantly improved in recent years. In fact, many home designers and homebuilders have placed an emphasis on developing new home designs that include the basement as livable space, by adding functional home offices, additional bedrooms or play areas for kids. Arguably the most attractive, cost-effective and elegant basement improvements that maximize return on investment are designing a customized basement home theater and entertainment space. · Provides additional livable space to your home: This type of room addition can significantly improve the value of your home – instantly. 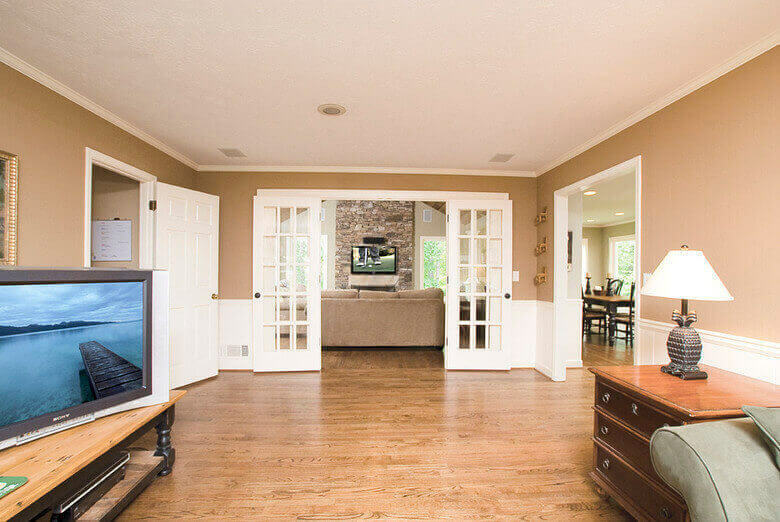 · Provides home owners with separate areas to host guests: Although you want to make your guests feel at home, there is something to be said about maintaining some level of privacy. Having a custom home theater and entertainment room designed in the basement is perfect for this. · Increases entertainment options: Whether you want to host a Superbowl party or your local college football team is playing on a Saturday afternoon, having a luxurious, cool and spacious home theater in the basement is the perfect place for friends to join you for the big game. Home improvement specialists typically work with home owners to create additions or remodeling projects that maximize their investment, not only for the short term, but long term gains as well. Without question, installing a basement home theater is among one of the most attractive and financially smart investments any home owner can make. Once you’ve made the decision to renovate basement by designing an elegant home theater and entertainment center in your existing basement, there is a proven process that tends to simplify and streamline the design and construction. The first step is contacting and selecting a basement home theater designer and developer that has a proven track record on working with home owners to design a home theater that is elegant, fits within their budget and is functional. One of the most overlooked design elements that need to be factored is managing the acoustics and lighting of a home theater. Arguably two of the most important attributes of the best movie theaters or concert venues is the sound quality and lighting designed to enhance the overall experience. 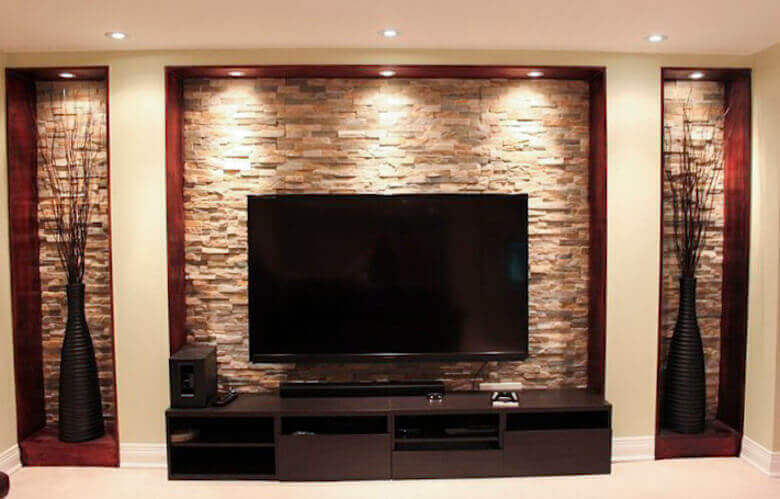 A professional and experienced home theater designer and contractor will factor these elements into your design; to ensure you custom basement is the one everybody wants to visit. When you meet with your basement home theater design and construction contractor to begin the process of creating your perfect home theater and entertainment center, having a list of must have and optional design elements is a great way to streamline the process; but also ensure you get the best bang for your buck. 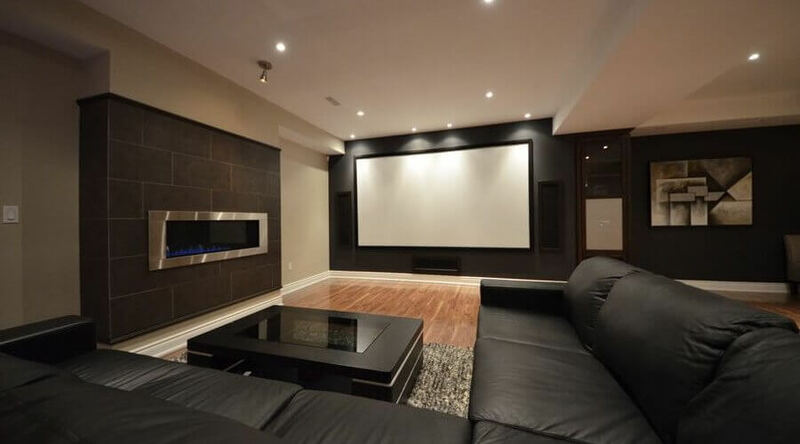 Here are 10 of the hottest growing basement home theater design ideas that home owners in North America are integrating into their custom basement upgrade projects. You might want to have a home theater that is elegant and functional, but if your basement is large and has additional space to include other items like a home gym, pool table, full bar, bathrooms, or extra bedrooms, make sure to start with the basic layout of items you want to include in your basement remodeling project – before moving onto the detailed elements of the home theater. · How many total rooms would you include in the basement? · What plumbing upgrades would need to be included? · What are the electrical needs for your basement project? · Do you need to add additional AC or heating ducts, vents or controls? When you work with an experienced basement designer and contractor, they will outline all of this during the design process. But being ahead of the curve and prepared for these important details will significantly improve the process. When the cinema became the popular source of entertainment in the early 20th century, there was typically an opening performance by a dance troop, comedians, musical acts and more. The theater not only had an elegant screen, but a stage in which to host different acts. Why not add a platform in front of the screen, so that your kids could “put on a show” before the big screen show? Not only is this fun and unique, but it improves socialization and creativity with children. · Viewing distance: A general rule of thumb is that the best viewing is 10 to 15 feet from general sitting area. · Sunlight: You’ll need to factor the direction of sunlight or if your basement has walls or walkout doors. · Additional Basement features: If you’re planning to add other items in your basement upgrade, factor the location of those items too, which will ensure they are not obstructed. The best home theaters can draw a lot of current, so it’s best to have a separate electrical circuit for the basement home theater. The best home theaters are ones with high-quality sound equipment. However, if you don’t use quality supplies, like speaker wire that is pre-wired during the construction phase, you’ll be disappointed. If you’re going to invest in an elegant home theater, why not design it to match your style? Consider designing your basement with a certain theme; whether its sports related, or hobbies you enjoy – personalization is a great item to consider. Although it’s assumed that all rooms are somewhat box shaped, the overall shape and dimensions of the workable space can, and often are customized to maximize your space. Work with your basement design team to be creative about the shape of your theater. Adding rounded walls can really spice up an area. Whether you install wood flooring or wall-to-wall carpet, considering the materials and type of flooring is vital – especially when it comes to the overall acoustics of the room. It’s always best to seek the professional advice of a contractor that has designed multiple basement home theaters. Contrary to popular belief, your home theater screen doesn’t need to be huge or take up an entire wall. Always pick a video screen that fits within your space and provides the best overall video experience. Although style and design is critical for an elegant home theater, function is just as important. Always consider this factor when choosing furniture and seating arrangements for your basement home theater project.